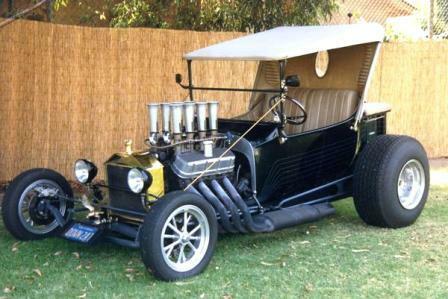 Tom designed the original model car kit with a 6 cylinder German aircraft engine and it was a quick hit with the youth culture of the day, selling more than two million units by 1973 (remember, without computers or video games and mostly only three TV channels at the time, model car building was the hot hobby). If the Red Baron wasn’t successful enough as a model car, in 1970 Mattel introduced the first of what would become many Hot Wheels versions of the Red Baron and many millions more have been sold, making the Red Baron likely the most popular T-Bucket ever. 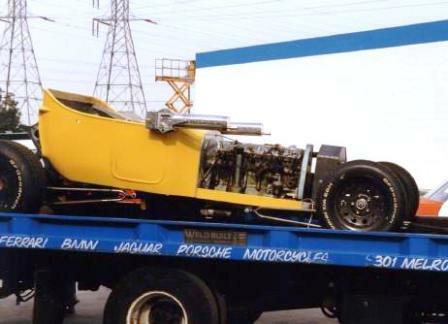 A year after the model car introduction, car show guru Bob Larivee worked together with Monogram to have Chuck Miller of Detroit’s Styline Customs build a life size version of Tom Daniel’s concept, which went on Larivee’s Promotions Inc. car show circuit starting in 1969, thus providing even more exposure. Not having easy access to an esoteric German aircraft engine, Chuck employed the new and exotic looking for the time 1968 Pontiac overhead cam 6 cylinder engine. For this and his many other accomplishments, Chuck Miller was awarded the coveted “Builder of the Year” title at the 2010 Detroit Autorama. You can learn more about the Red Baron and Chuck in his limited edition (1000 copies) biography, “Styline Customs: Chuck Miller” by Tony Swan. To find out how you can purchase this new book directly from Chuck, send an email to millerckpl@gmail.com. Today, the original Chuck Miller Red Baron resides in the Smith Collection Museum of American Speed in Lincoln, Nebraska. All of which brings us to the current news that a Red Baron replica is now listed for sale on eBay, with a starting bid of $14,000 (and 6 days to go). I believe it was previously listed in October, 2010, and evidently didn’t meet reserve then. You don’t have to be too eagle-eyed to notice that this particular Red Baron is powered by a big block Chevy rather than an OHC Pontiac 6. The story goes that due to its overwhelming popularity two more Red Baron replicas were produced by Jay Ohrberg, the original “Mr. Roadster” (a story for another day): one a V8 and the other a 6. It turns out that my legendary T-Bucket chassis builder friend, Ted Brown, did much of the construction on both of those Red Baron tribute cars. “I designed all the extra goodies on those cars: headers, machine guns, gun sight for the radiator cap … lots of stuff you can’t see,” said Ted. In the photos of the 6 cylinder Red Baron construction above, you’ll note that Ted did the fabrication work around a pretty much unmodified fiberglass T-Bucket body, which was later replaced at Jay Ohrberg’s Hollywood Cars. It’s great to have this opportunity to, hopefully, add some worthwhile information to the lore of such a famous T-Bucket. Feel free to share your own Red Baron story with us by commenting below. P.S. 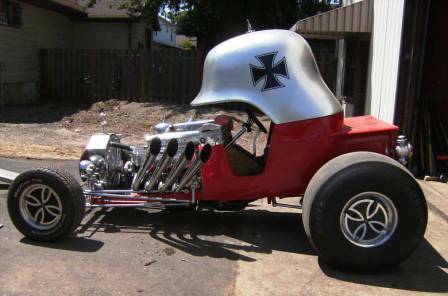 (12/10/10) Checked out the eBay bidding on this Red Baron tribute car today and it’s at $14,544 with just four bids. The owner also answered a question and stated that the bottom line price he was looking for is $28k. Will check back over the weekend to see if the current bids are doubled.